Usually I feel like I don't have much to share, but right now I have a zillion things to tell you and no time to do it! So...this will be short and sweet. 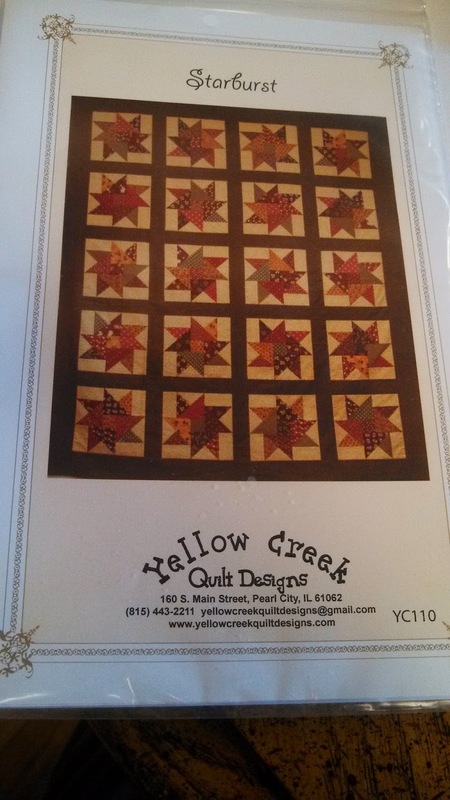 Years ago I went to the AQS show in Chicago and bought a kit and pattern for Starburst, by Yellow Creek Quilt Designs. Since I started vending I have always used it for a table cover in my booth - just because I like it and because it fit my table perfectly. The problem was that everyone liked the pattern, but it was not my design, so I was not selling it. I got tired of telling people that I did not have it, and finally called the girls at Yellow Creek and ordered a bunch. I have sold them all except this one, so I am putting it up for grabs in a quick little giveaway! And...I have designed a new quilt to fit my tables at shows! If you would like to win this pattern, please leave a comment below and let me know if you have a favorite pattern. I would appreciate it if you are a follower, too. Ozzie says...have a nice weekend! I will pick a winner next week! I don't really remember a lot of peer pressure in my school days, but I am feeling it now! 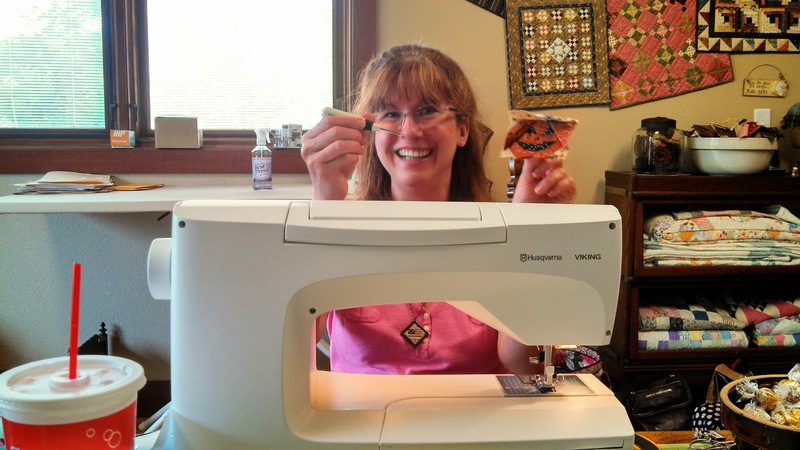 Some of my quilty friends are rather villainous! One of them is Nancy - she lives in California, but her son is in Minnesota. 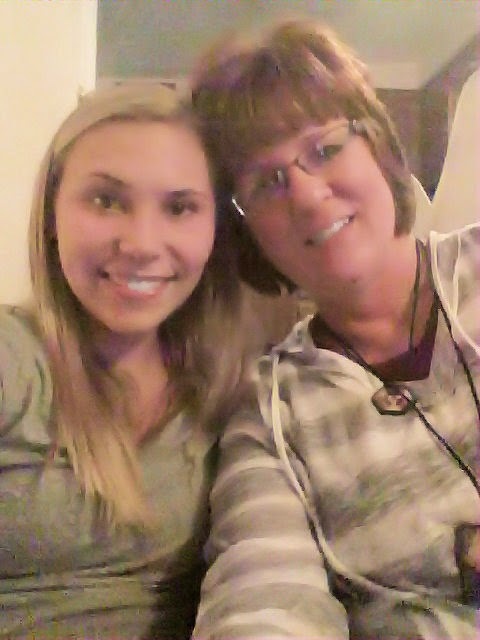 Which is good for me, because recently after a visit with her son, she drove south to my neck of the woods! We met at Inspirations quilt shop in Hills, IA. I think Nancy fell in love immediately! We had a great time there - she found a few kits that had to go home with her and I added to my meager (haha) stash. The pattern is designed by The Woolen Needle - isn't it nice?! I already know where I want to hang it, now if I could just get the time to make it! We made a stop in Kalona as well. Kalona has a large Amish community and is an interesting place to visit. We stopped at the cheese factory and bought a few cheese curds. They have a lot of unique things there, including chocolate cheese - which sounds horrible, but it's really good - it tastes just like fudge. The next day we decided to stay spend the day sewing. 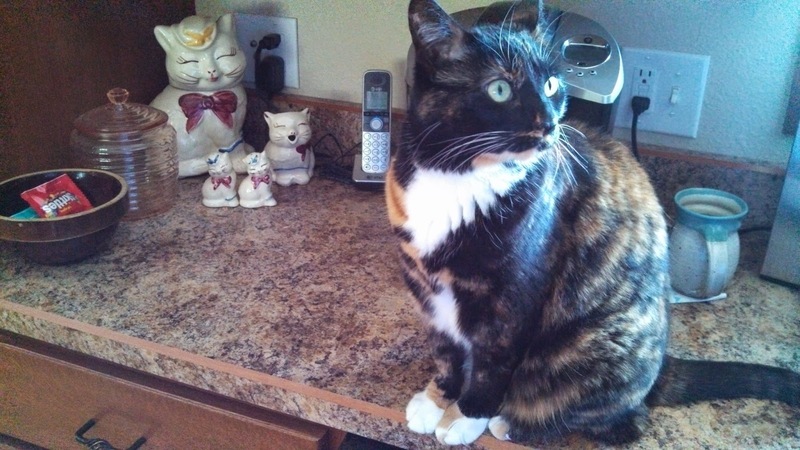 Here's a picture of Nancy - she's making Poor Lil' Punky...remember him? 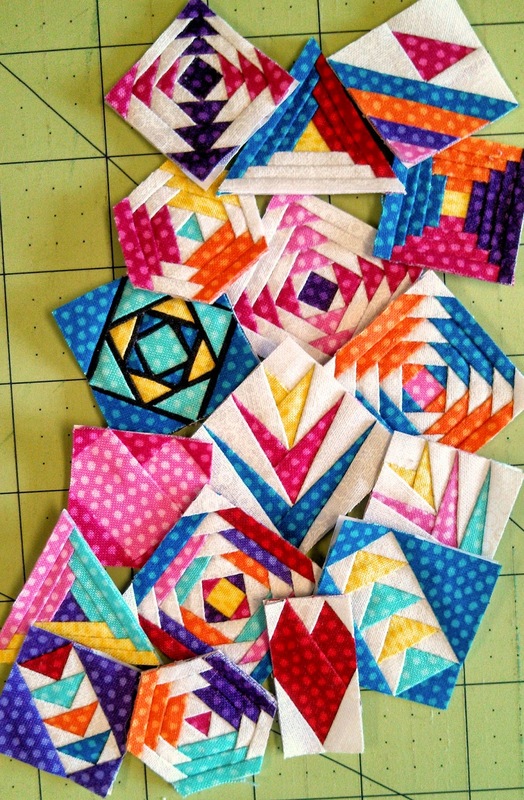 I'm not sure that she's fallen in love with paper piecing just yet, but she may be one step closer. It was a blast, even though I evidently do not know how to sew a quilt top together. I was working on my summer block of the week (from 2 years ago) from Primitive Gatherings. As I said in my last post, all of the blocks are finished. I just need to sew them all together and add the borders. Easy, right!? NOT SO MUCH! I used my seam ripper way too many times, and finally gave up and went back to making tiny blocks for jewelry. I love the lip balm and lotion (upper left corner) - have you tried them? The brand is EOS. The pink is berry scented and the yellow is lemon. LOVE THEM! And look at the cute little kit! It is for a 6" pillow - all of the wool is included - so cute. I can't wait to make it! And what cute socks?! My feet are frozen for about 9 months out of the year, so these are just perfect. And yes - that is a pin cushion in the lower left corner! Love it! It is nice and thick and heavy - just like a pin cushion should be. Love!!! I almost forgot to show you this awesome little zipper bag she gave me! It's already traveled to Florida and back (more on that next time!). Yep...love it too! Can you tell that I LOVE it all!??!?! Thanks Nancy!! We had so much fun, and her stay was much too short. Hopefully next time she will be able to stay longer. Aren't they awesome (and isn't Ozzie The Model a pretty boy)? 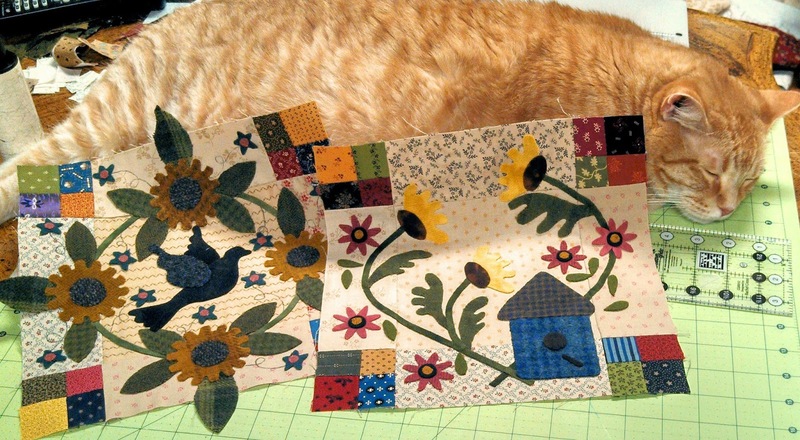 I love sunflowers and I just know this is going to be a gorgeous quilt. They always are - I've asked Lisa to design something ugly so that I won't want to make absolutely everything she sells, but she feels the need to keep making beautiful stuff! 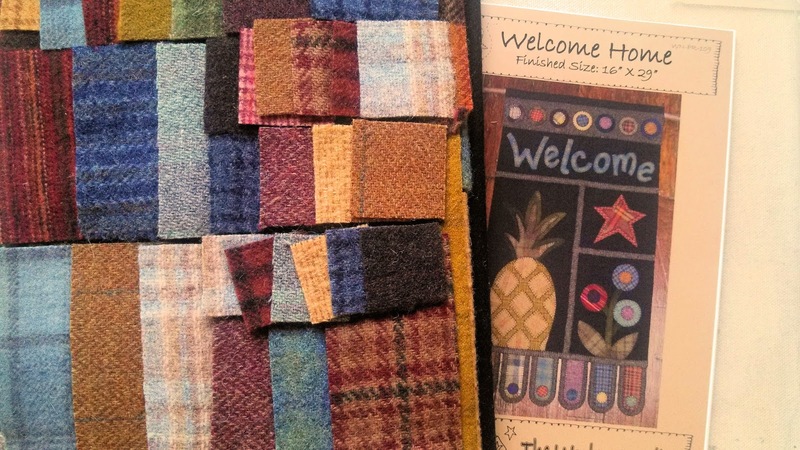 Have you ever entered a quilt in a contest? I think a lot of people are intimidated by it. But...Jennifer, from The Quilted Cow is running a contest on Facebook right now. It's free to enter and all you have to do is send her a picture of a quilt that you have pieced! SIMPLE! And, the winner gets to choose a piece of jewelry from my website, as the prize! FUN! I really hope you enter - there are only a couple of days left. But, at the very least, go vote! 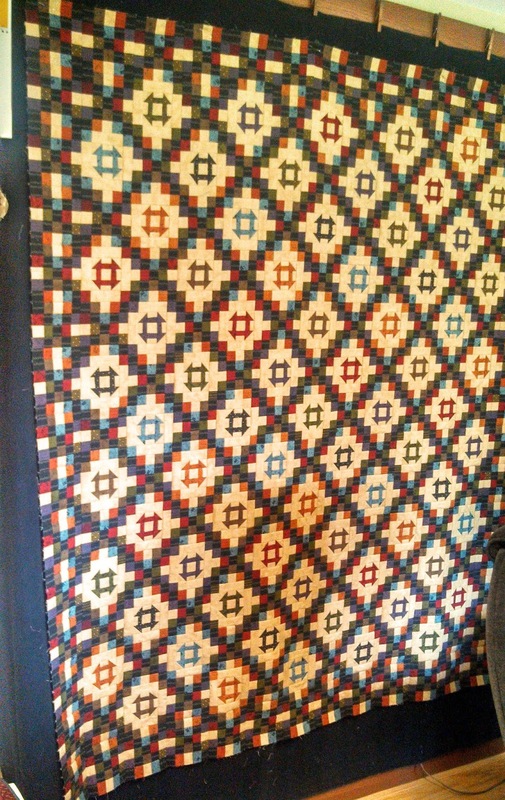 The quilt with the most "Likes" is the winner. 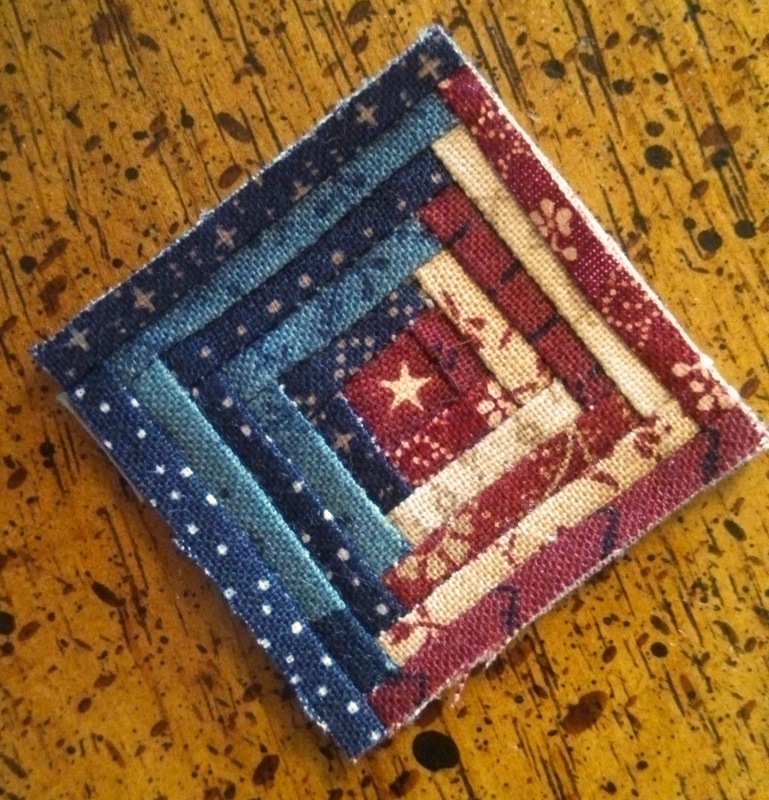 Here is the link to take you to the contest page...Quilt Contest. Hurry up! Enter a quilt! 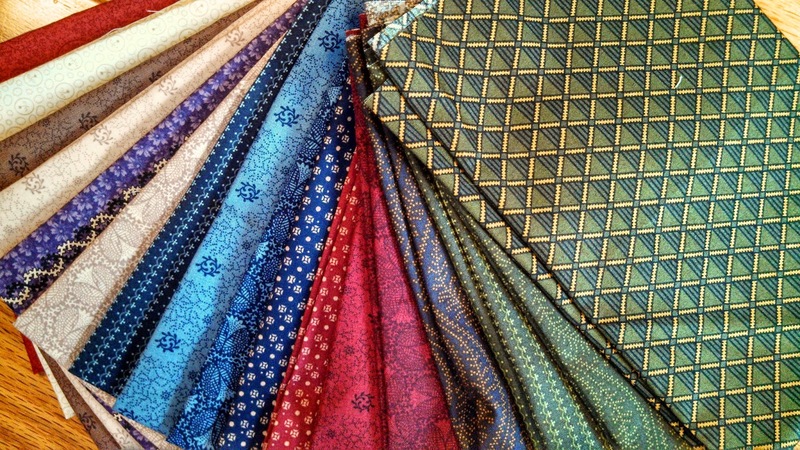 I want to leave you with this - these fabrics are waaaaayyyy outside of my comfort zone. But...I have decided that for Charming 3 we are going to do something a little different. 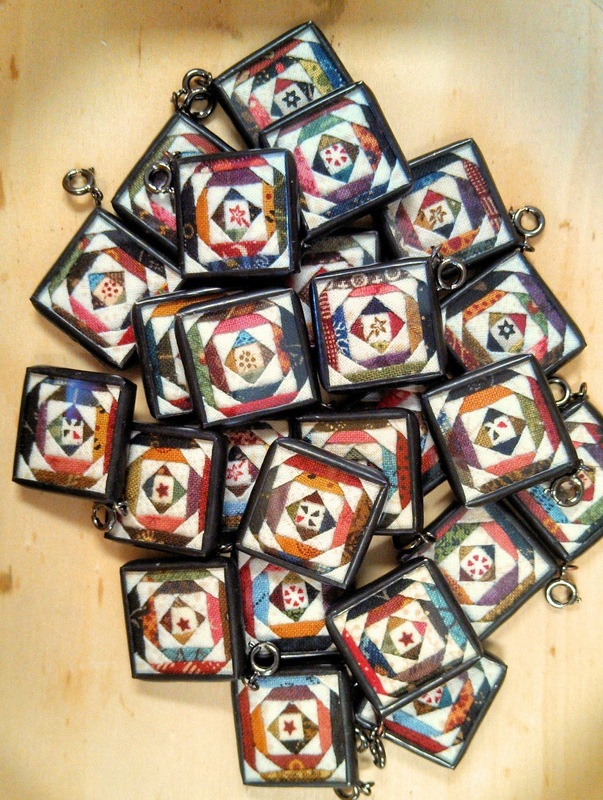 The new charms will be offered in darks and also in brights. So...if you are a lover of brights - you will like these charms. If you are interested in Charming 3, the sign ups will be next month. 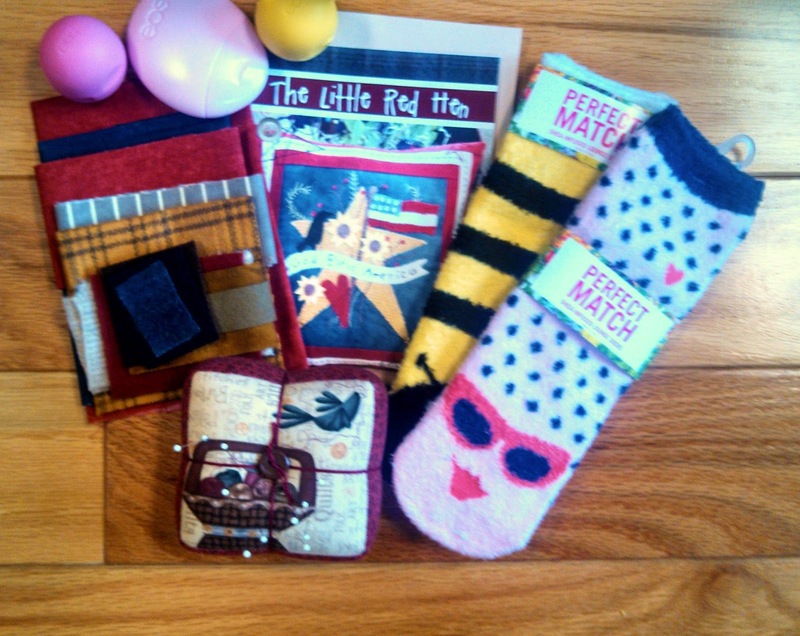 Send me an e-mail (julie@meandmystitches.com) to get on my mailing list, to be sure you get the info. Not a great picture, but you can still tell how pretty she is - such a cutie and lots of fun to be with. She has a great sense of humor and never complains. 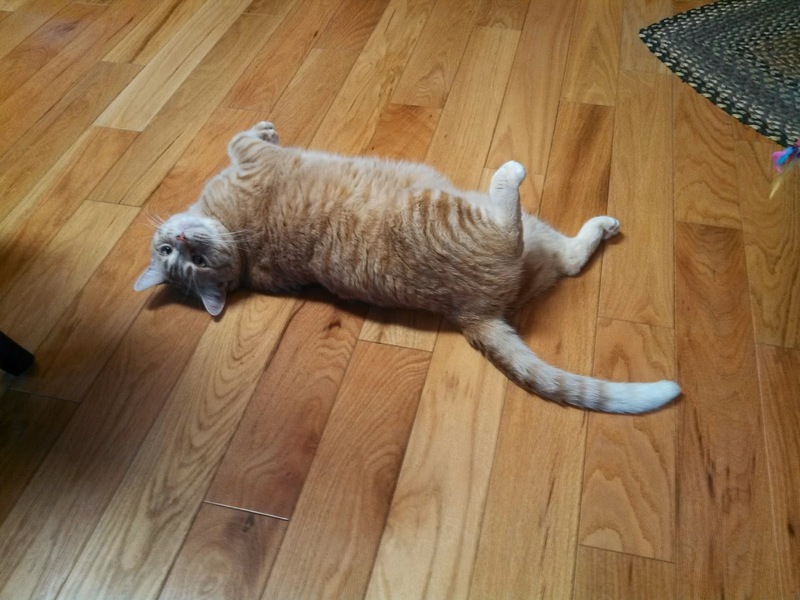 She's always game to do anything, will try anything, and seems perfectly happy to hang out with us old folks. Oh wait...I'm only 29...so no wonder she doesn't mind being with me! Lol! I've been working away on a new quilt design and it is finally at the longarm quilter's where I know she will work her magic. It's called Gathering Scraps. I made myself write the pattern before I started piecing the quilt - so it's almost ready to be published. It just needs a few little changes and I will be able to finish it up. If you remember my awesome road trip (FART - search my blog for those posts!) with my friend Kim, we shop hopped our way to Menasha, WI and back and stayed at The Gathering with Lisa Bongean. Lisa is such a kind and generous person and while we were there, she gave me all of this fabric. I have used tons of it in my jewelry and even in some other quilts and bags. But, I decided that I wanted to make a quilt using only her fabric and name it after her amazing retreat center. The background fabric is one of her muslins - I have bought yards and yards of it - it's the perfect color. I also added in one of the blue fabrics from her Snowman Gatherings fabric line. Speaking of Primitive Gatherings...have you signed up for their Summer Block of the Week? It is amazing, as always! I talked myself out of it about a thousand times. My first reason being that I have not finished the one that I did from 2 years ago! 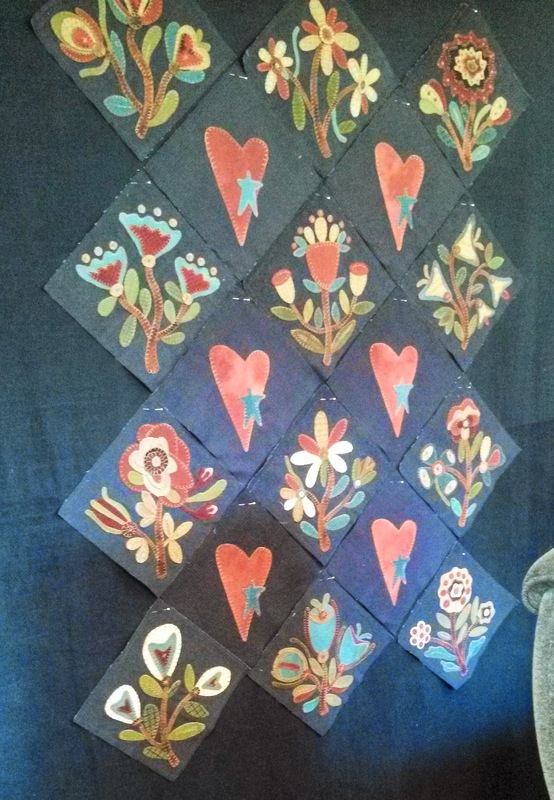 Thinking about that gave me enough motivation to get those blocks back out (I am the Queen of finished blocks that don't get turned into quilts) and trimmed them all down to size and plunked them on my design wall. A friend was coming to visit soon for a little retail therapy and sewing - so that will be the perfect time to finish this quilt! (More on that on the next post!) Here are the finished blocks - remember them? I still refrained from signing up for this year's SBOW - even though some very bad influences kept taunting me about caving in to the pressure and signing up (they know who they are!). I stayed strong! I don't know if you can see, but each basket has a little flower growing in the center of it.The charms are 3/4" in size. 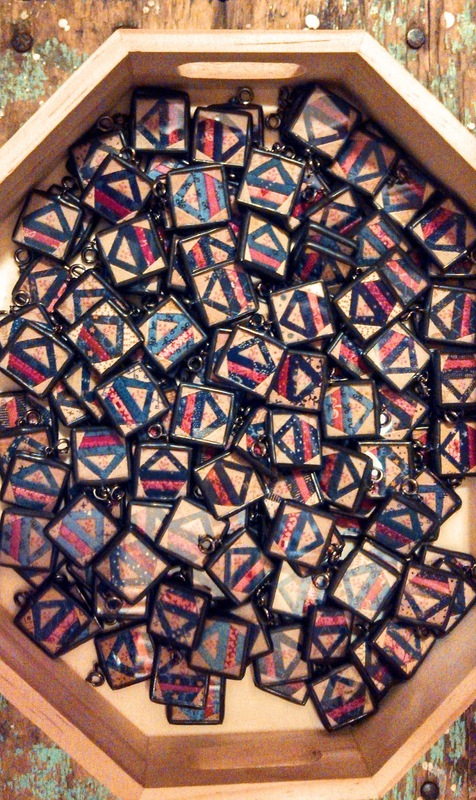 And here are a bunch of the charms, all ready for Marty the Mail Lady to come and get them. 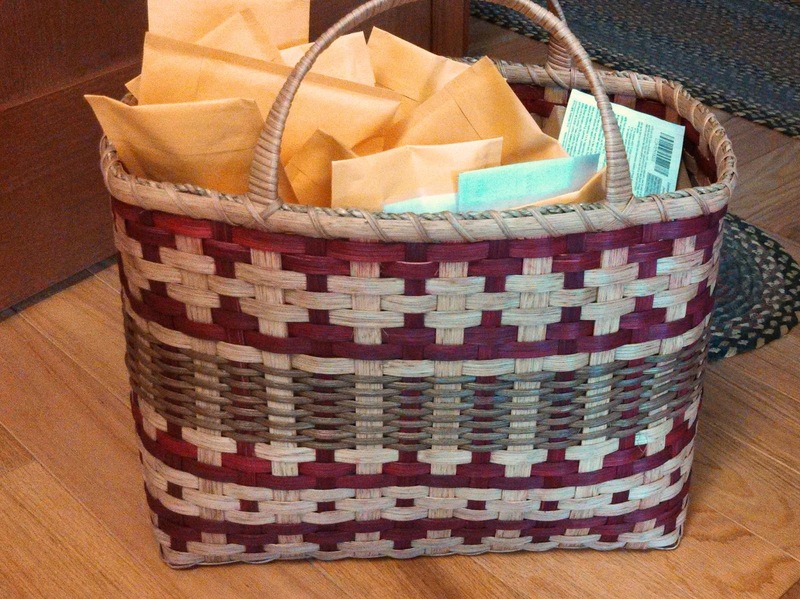 It doesn't look like that much, but that is a big basket! 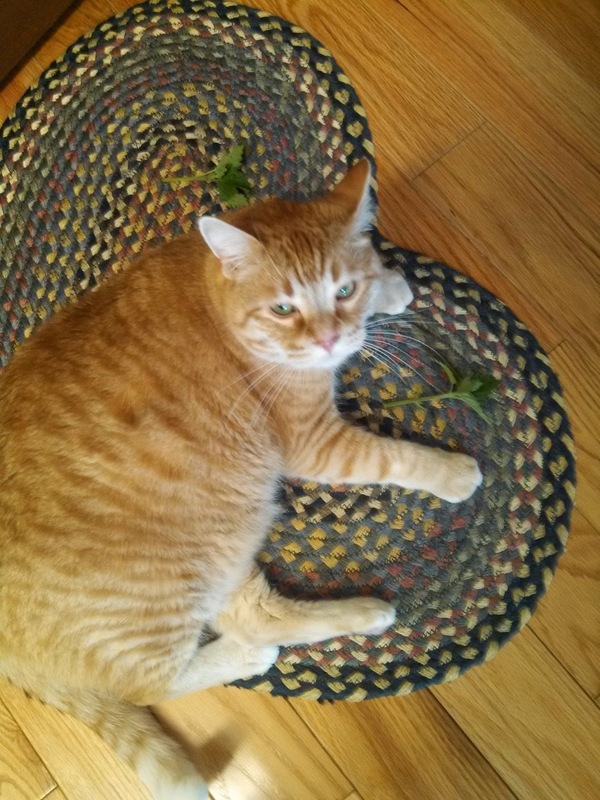 Speaking of which - don't you love my basket? I got it from one of the vendors at the Stover, MO show. I did not get her card - and I can't remember her name (you would think that a 29 year old could remember these things! ), so if any of you know her, please send me her info and I will post it She makes beautiful baskets, and I pretended to steal this one all weekend. Every time I walked by, it somehow jumped on my arm! 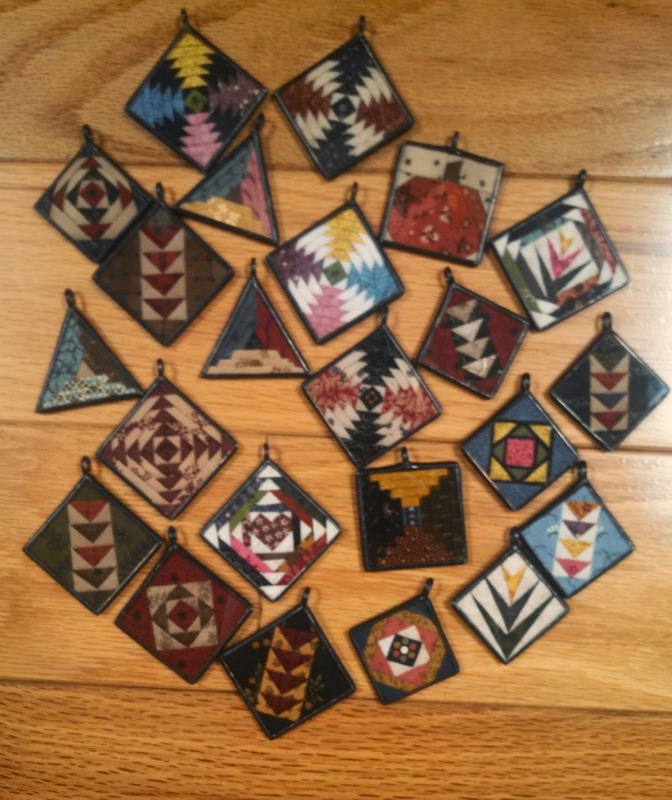 She sold tons of these - I bet she had to go home and get busy making more - they were a big hit. And a patriotic log cabin that didn't quite get finished! And Callie - after her little nip fest. She usually gets all wild and crazy, then has to sleep it off! 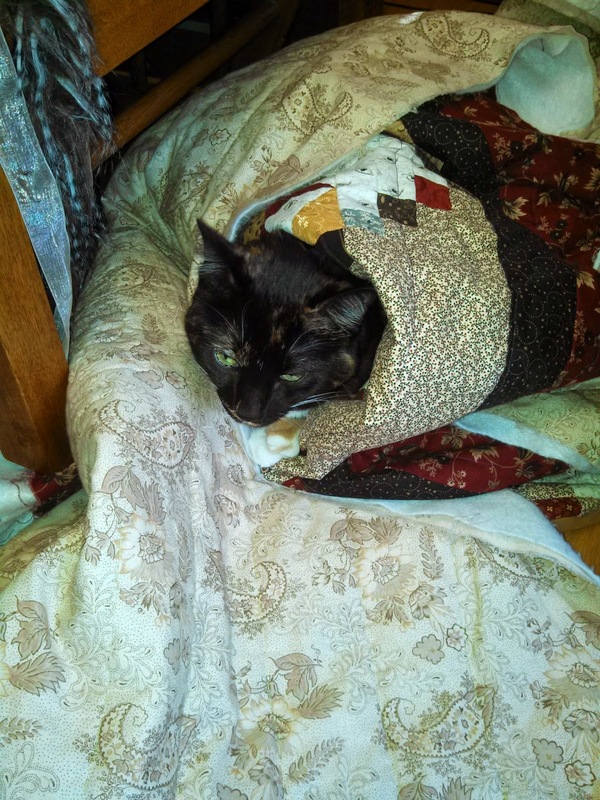 This is the quilt that I've been hand quilting f o r e v e r. She knocks it off of the foot stool and then curls up in it! That's it for now! I have lots more to tell you about, so I will try to post again in the next week (instead of waiting over a month! ).